When you notice one or both twins to be hungrier than usual, the first question to the pediatrician is, "When can they start eating solid foods?" Each twin will know when he/she is ready, but there are a few signs that mom can look for. Babies go through growth spurts just like other children. They may seem hungrier at times, but that doesn't mean that solid food is next on the menu. Watch them for awhile to see if their increased hunger is consistent. No matter when you introduce solid foods into your twins' daily regimen, they will still need to drink breast milk or formula. Most of their nutrients come from their milk source and they will still require milk as their main source of food throughout the first year of life. Theoretically, babies can begin solid foods between four and six months of age. This is not a hard and fast rule however, so if your twins haven't begun to exhibit signs of being ready, don't push them. Here are just a few of the signs that might signal theyre ready to begin solid foods. First, your child must have adequate neck control. If his or her little head still reminds you of a bobble head doll, solid food is not on the menu. In order to be able to swallow anything thicker than milk, babies must be able to hold up their heads. Without proper control, baby may choke when eating. Babies naturally push things out of their mouth. When you begin feeding them with the bottle or the breast, they push their tongue out when opening their mouths. This is called the extrusion reflex. It's nature's way of protecting babies from choking. So, of course, very young twins must overcome this reflex to order to eat. Your kids may be four months old, but if they continue to push things out of their mouth, wait just a little bit longer for the reflex to kick in. A baby needs to learn to chew before they can eat. Chewing pushes food towards the back of the mouth where it heads south to the stomach courtesy of the swallowing reflex. 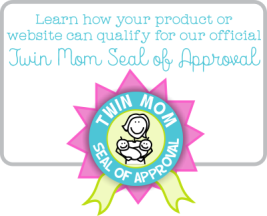 Chewing motions are a good sign that your twin(s) may be ready to eat solid foods. Weight gain is another good indicator. When the weight of your baby has doubled, they could be ready for foods. This alone is not a sure sign, but when it is combined with other indicators, the solid food stage is close at hand. 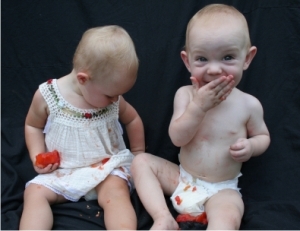 If your twins are approaching six months of age and still not eating solid foods, continue to be patient. There is no hurry. Increasing milk feedings to combat hunger is perfectly fine and will not harm your children in any way. When baby needs something more than breast milk or formula he or she will definitely let you know. Starting solid foods is not an exact science and you should remember each twin will be different. *This article is not intended as actual medical advice. Always consult the proper healthcare provider with any questions or concerns you have.